Peter Swan in Creative on 17 October, 2015. During a recent flight from the UK to Italy, I was struck by the beauty of the Alps from above. Luckily, I was carrying my DSLR and 300mm lens as hand luggage, so I decided to take a few shots through gaps in the cloud. Even though the plane’s windows were grimy, I was pleased with how my shots turned out, though they did require some contrast adjustments and sharpening in Photoshop afterwards. 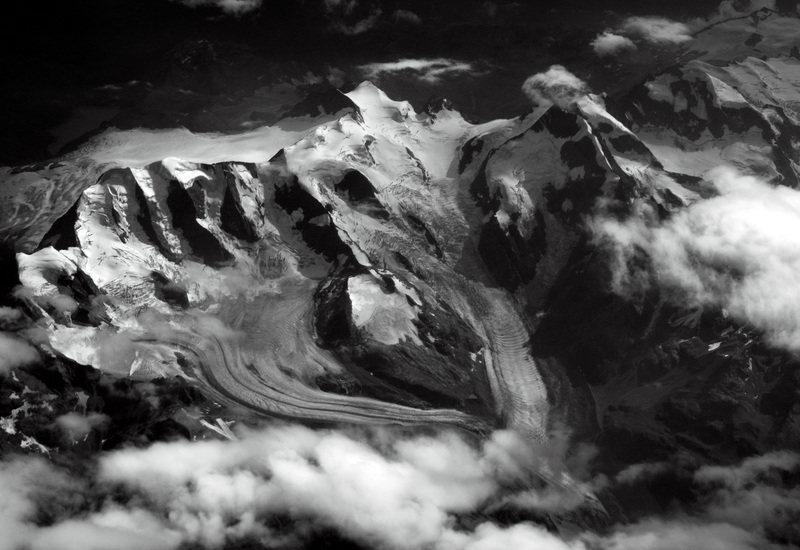 The colours were largely muted by the haze and distance, so I chose to convert this image to monochrome to emphasise the contrast between rock, cloud and ice. Even though I spent the following week in Venice, one of the most photogenic cities in the world, this shot remains one of my favourites which I took during that holiday.